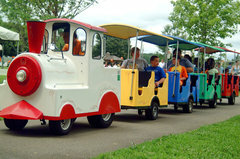 Trackless Train Ride rentals are delivered by Bluegrass Rides.com. We have done recent rentals in Lexington, KY, Louisville, KY, Frankfort,KY, Bowling Green, KY, Georgetown, KY, and Nashville,Tn . But we are available in lots of other area just check our service areas page. To get more information on booking 1-859-948-9327 or simply book online.